On the 26 March 2016, the Oxford Sandy and Black Pig Group were very honoured to have Mr Andrew Sheppy FLS .entertaining us with his knowledge of the breed that stemmed some 40 years! Mr Sheppy, together with volunteers, ran The Cobthorn Trust, which was a charity dedicated to critical genetic and biodiversity conservation work. Cobthorn Farm was Mr Sheppy home which had been in his family for over 200 years. In 1976 Mr Andrew Sheppy purchased two gilts from Derek Dunstan in Doncaster one called Sarah (a name was chosen out of family tradition) and the other Susie, who produced the Cobthorn Alexander. There was no serious recognition of the breed at the time. 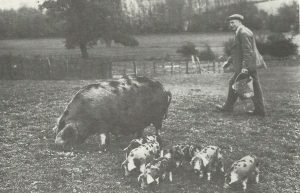 Finding a boar to breed from in these early days was, as Mr Sheppy described as “being near to impossible”. So pigs were bred within that family group. So Alexander was put back to his mother (Susie) and his sister (Sarah) and after several generations and careful selection, the famous Cobthorn Alexander Brigadier III was born. The next steps was to try and grow the herd and bring in new blood. Breeding of the OSB’s continued at Cobthorn with the original bloodlines until 1982. However, in the September of 1982 Mr Sheppy purchased six sows from Bob Brickell’s Chasewoods herd, which were in Oxfordshire. The lines were Chasewoods Princess, Chasewoods Duchess and Chasewoods Lovely Lady. Chasewoods Princess had litter sizes of 20 and 22. After awhile the Princess line could not be put back into pig, which was a great shame for the breed. As the years rolled on Mr Sheppy needed to get the breed recognised as with no Herdbook (recording the bloodlines and breeding) the RBST and other Associations would not give the recognition that the breed deserved so with the help of Steve Kimmins, Geoffrey Cloak, and Kath Blackwell the Breed Society was formed together with the first herdbook Volume One. So in 1985 Volume One of the herdbook was produced. The search for all OSB’s in the country was on and all those that were found went into the herdbook, there were 15 boars, number from 1FS to 15FS. At the time ALL boars were inspected and this was down to Geoffrey Cloke who travelled tirelessly up and down the country. We had 72 Sows, numbered from 1001A to 1072A. There were then 29 herds recorded. Cobthorn Farm was the largest herd with 10 sows and four boars. So with the breeding stock underway and the recognition of the bloodlines then came the Registration Procedure…As mentioned all potential boars were inspected and if they made the grade they were given a “Foundation Stock (FS)” number. All sows that were put forward went in to the Herdbook with a number and the suffix “A” starting at 1001A. The sows from registered parents were registered with a suffix “B” and their offspring registered with a “C” followed by their offspring with “D” until their offspring were pedigree without a suffix. So the start-up Vol 1 was created in 1985 and it was safe to say that ALL OSB’s were recorded in this volume with all their diverse and wonderful naming system. So in 1986/87 Volume 2 was produced whereby the rules were defined for the future of naming, therefore all pigs that were registered with the Society must have the prefix of the herd of birth. Therefore in Volumes 1 and 2, registered pigs have, in addition to the prefix, an individual name or names containing the line name of the dam or of their sire. These names may also consist of the line name with the addition of an individual number. An example give was Anyfarm Alice 3rd or Anyfarm Alistair 5th. Then to add a little spice to the naming game of the time you could also give an individual name, which was used, instead of a number. For example: Anyfarm Alice’s Rose BUT NOT ANOTHER LINE NAME e.g. Sybil. These line names were listed in Volume 2. So to avoid confusion, these line names may not be used as individual names. BORIS BLOODLINE: This bloodline was based on the boar Farway Boris and was bred at the Farway Country Park from stock from Portsmouth City Council’s Leighpark Herd. The only Boris line boar registered appears to have been Happy hogs Boris’s Ceasar 3FS bred by Nancy Howard. The Boris bloodline line influence on later stock is via his daughters of the Gloria line. CLARENCE BLOODLINE: This bloodline is based on Donmar Clarence 4FS. Bred by Don North. Clarence 4FS was out of one of two sows from Mrs Watts and by a boar known as Aristotle whose origins are not recorded. Again this bloodline line is another simple line in that all the Clarences’ trace back to Clarence 4FS. ALEXANDER BLOODLINE: The original Alexander came from the pigs, which came to Mr Sheppy’s Farm, Cobthorn from Derek Dunstan in 1982. Cobthorn Alexander was the first and his Great Grandson – Cobthorn Alexander’s Colonel 5FS was widely used in the 1980’s and is the origin of the later Alexander Boars. Mr Sheppy told us how Colonel was picked up from one farm to service sows up and down the country until one farmer decided to weigh Colonel as he was a big boy. Mr Sheppy was told that Colonel weighed 728lbs! Mr Sheppy talked about Colonel with such fondness reiterating how gentle and wonderful he was and how he sired some wonderful progeny. Colonel was out of a Chasewood sow. ALISTAIR BLOODLINE: This bloodline comes from Cobthorn Alistair 13FS born in 1985. He was out of Bemborough Alice 1015A who was pure Chasewoods breeding. His sire was Cobthorn Alexander’s Colonel 4FS so could have been called an Alexander, but being three quarters Chasewoods breeding was made a separate line. The Sow lines origins are a little more complicated than the boar lines. There is a relatively small number of main sources. All the present day sows are related to the four surviving boar lines. CLARE AND CLARISSA BLOODLINE: These derive from the two sows from Mrs Watts at Don North’s Donmar Herd. Both Donmar Clarissa 1013A and Donmar Clare 1012A were by Aristotle. Clarissa was a litter sister of the line boar Donmar Clarence 4FS. The Clare bloodline was out of the other sow by Mrs Watts. HENRIETTA BLOODLINE: Mrs JE Loggin registered three Henrietta sows in Vol 1 all of which were litter sisters to the boar Edgehill Henry’s Cavalier. There were no further registrations of this bloodline. In the 1970’s there was a sow with piglets at the Smithfield Show and found later belonged to Hedley Le Bas at his farm park up at Dartmoor but did not appear to be related to Mrs JE Loggin line. THE CHASEWOODS LINES: Mr Sheppy talked of The Chasewoods and their influence of the lines they upheld at the time. They were as follows: Alice bloodline came via Bemborough Alice 1015A. The Alison bloodline was the daughter of Alice. Chasewood Buttercup1007A. Duchess came via Cobthorn Duchess 1022A. The Lady Bloodline came via Chasewood Lovely Lady. Chasewood Polly 1016A, Chasewood Polly 1016A. Chasewood Sandra 1023A and Sybil came via Bemborough Sybil. A sow called Somefarm Sybil 10th is by a boar Otherfarm Alistair 2nd and out of Somefarm Sybil. Otherfarm Alistair 2nd is out of Otherfarm Alice 12th and by Otherfarm Alistair. Somefarm Sybil is by Yetanotherfarm Alexander who is out of an Alice KEEP UP…. THAT MEANS SOMEFARM SYBIL 10TH IS GENETICALLY AN ALICE! The Oxford Sandy and Black herdbook is now being kept with the British Pig Association (BPA), which is why it is important for you to be members of the BPA so we know who has what of what bloodlines, notify your litters from your registered sows so we know the numbers are up and know who and where you are. Without the information being recorded by the BPA our bloodlines can and will be lost the breed will/could diminish. We now have the added bonus being recognised with the RBST. This recognition is with thanks to the work of Andrew Sheppy, Patricia Colson, Peter Colson, and Dr Rex Walters. The RBST recognises breeds with six generation pedigree or with 40 years breed history. Full recognition comes about from DNA testing of the industry pig breeds and these blood tests are able to recognise each pig breed. So breed pure, source your boars to hire or purchase, visit breeders to know your next progeny and value your stock and be proud to be an OSB Breeder!